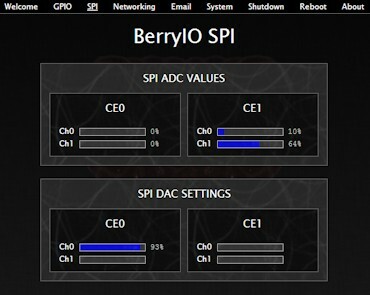 The aim of BerryIO is to enable developers to control the Raspberry Pi and its GPIO ports remotely from any device with a web browser, without ever needing to connect a screen or keyboard to the Pi itself. Full GPIO control including input/output mode and on off toggling. Support for Raspberry Pi revision 1 and 2 including 512MB version. SPI DAC control and ADC values display. Control of HDD44780 or KS0066U compatible LCD's. CPU information display, including temperature. Disk and memory usage information. Network status view showing connectivity, signal strength, etc. Command line interface which offers the same level of control as the web browser interface. Email notification with a link to the BerryIO web browser interface. // GPIO settings and uncomment the revision 1 settings. Definitely an interesting project that is updated fairly regularly. Full time developer influenced by Apple, Linux, 80's Era and so on. This work is licensed under a Creative Commons Attribution-ShareAlike 4.0 International License..